I try to keep the blog more about cool old stuff I come across and less about me, but I’m gonna chuck that rule out the window for now – ’cause she said yes! That’s right, instead of a gorgeous girlfriend I’ve now got a gorgeous fiance, and I’m pretty stoked about it. I won’t go into too much detail, but the day started with a 5.30 run out to Clarendon swap meet. After brekky we headed down to Austinmer way, browsed in a few vintage stores, went for a swim at the beach and then had fish and chips in the shade overlooking the water. We love walking along the rock pools, so after lunch (after a subtle suggestion), we walked out to a quiet spot with the crashing waves at our feet. This is where I popped the question, and obviously she said yes! We rounded the day off with a drive back through the Royal National Park. All in all it was one of those great days we love spending with each other. A nice cruisey day with old cars, vintage collectibles, a nice drive and a swim at the beach. And it’s because we love sharing all of these things together that I’m pretty excited about marrying her. I wanted her to look back on the day we got engaged and think of all of those things we love doing, as opposed to doing it in some random restaurant with a bunch of strangers looking at us. Lets face it guys, if she loves going to a swap meet after a late night the night before, she’s a keeper! I can’t talk about this without posting a pic of the ring. She wears almost no jewellery so picking a ring was always going to be a challenge. I knew she’d be after something simple and elegant, so after a whole bunch of contemplation it hit me an art deco ring would hit the spot, and also reflect our love of vintage style. With that I did a bunch of googling and took some pictures and ideas into Lane Gems and Jewellery in Sydney. 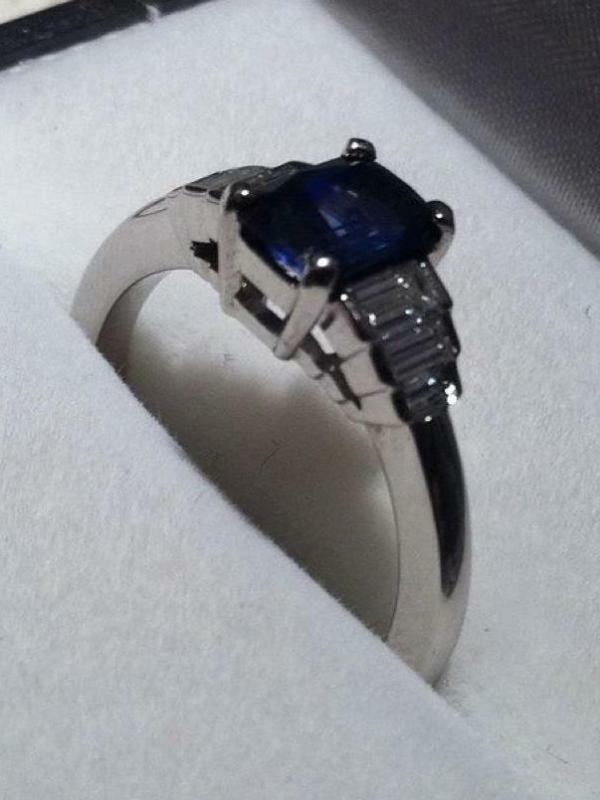 The ring features a blue sapphire as the main stone, 6 baguette diamonds on the shoulders, and the body is white gold. I took a punt with the design, and luckily she loves it. I’d recommend Lane to anyone as well, great guys to deal with. Needless to say, the wedding will feature lots of old stuff and won’t be traditional! I’ll keep you posted. Awesome news ..,. Congrats to all. congrats hewey, nice looking ring.